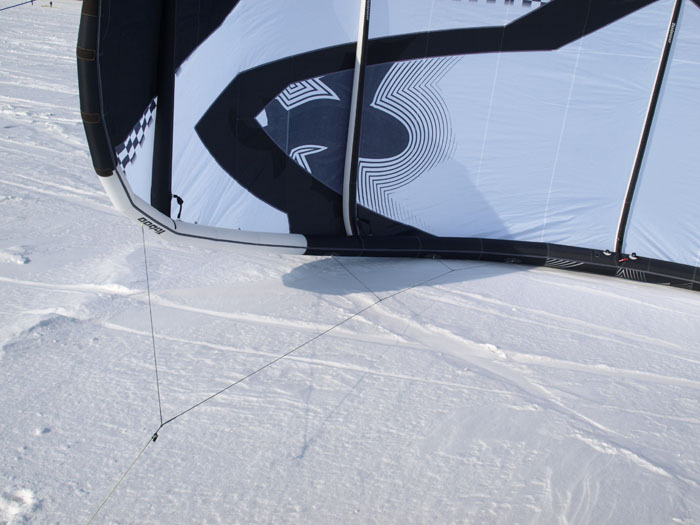 Last autumn a very interesting annotation was found on the Best Kiteboarding site: "For course racing and light-wind conditions, the largest Taboos are the most aerodynamically refined kites we've ever made. 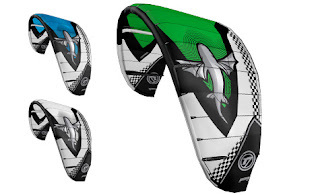 Every gram of spare has been trimmed back to deliver maximum light-wind performance and racing advantage." Later some blurb from Andrei Fishinsky the official Best representative in Russia was heard: "There is someone somewhere in the summer course-race winning on Taboo..." Andrei is a complete free-styler, it is hard to ask for more details from him. Of course I wanted to try this new queer animal - the race Taboo in 17 sq.m. And today the package has arrived. Rush to the ice immediately - the wind is perfect, 6-8 kt! Some numbers to start. For me those are important. 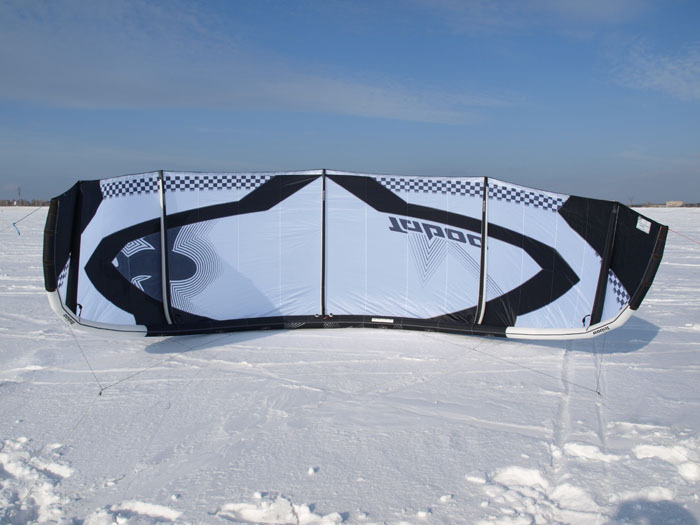 - Dry kite without lines and bar weighs 4.9 kg, very impressive for inflatable of such size. - Wing span - 9.4 m!!! - Aspect ratio is about 5.2, very modest if compared to the modern race-class parafoils. - Struts - extremely thin, 5 pieces. - Leading edge is not too thin in the middle but diminishes very fast to the wing tips. - Very interesting design which is not very common for the recent years - no pulleys under the wing! You may forget about sand clogging the pulleys and regular worn tie replacement. When I was lifting up the kite at the steady 6-8 kt I did not expect any miracles. Folk lore is certain that "any inflatable bigger than 13 sq.m. is nonsense". 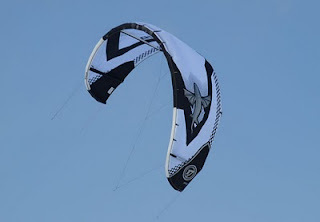 First surprise - the kite steers very lively (25 m lines). You did not get it. Not just lively, I would say it steers excessively fast! 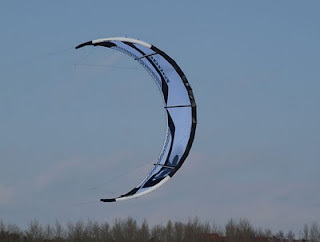 If you push the kite from neutral into the kite-loop it makes the full turn loosing just half of the elevation. 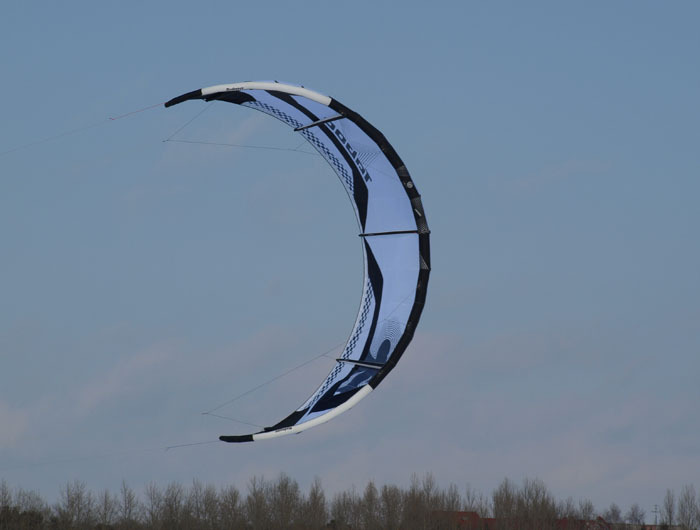 While skiing in any turns with kite-loop and down-loop it flies through all rotations correctly, loosing no power, moving along smooth arch with no stumbling or spinning around the wing center. You can make the turn in down-loop even when the lines are below 40° to the horizon! This behavior is unexpected, at first I have to get used to it. I even touched the snow with the wing tip once when got distracted. In about half-hour such liveliness in turns feels not as just the matter of comfort but as the vital necessity! 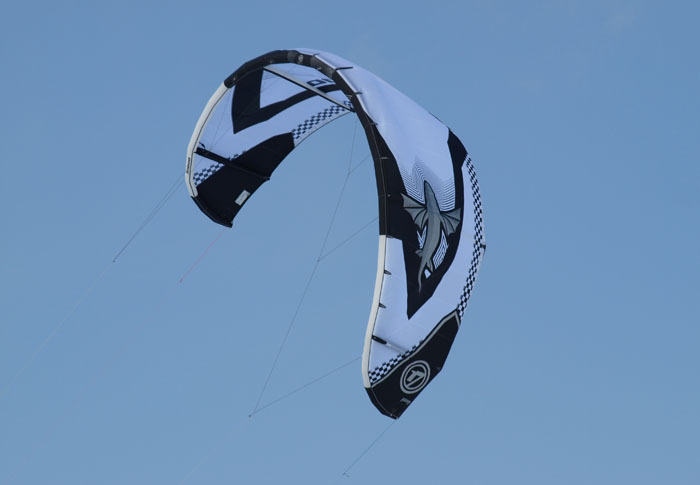 In light winds it allows for dynamic pumping better than with a kite on handles as well as jumping. I even managed to swing this huge wing fast enough to do a front-roll with my 2.15 m skis. The importance of such maneuverability in the real races cannot be overestimated. Kite-skiing at 6-8 kt is very comfortable. Going quite fast, upwind easily draws 90° between ski trails - just as "the real" race parafoils-"sausages"! Moving to the Boomerang site where the wind is usually lower at SE. Things slow down, the power diminishes but the kite is still pulling me half-wind. I am flying the kite almost over the snow to make clean experiment and exclude the influence of the faster wind at the higher altitude. Stopping down to take measurement: 3.2-3.6 kt - unbelievable! Any other inflatable I have tried before would certainly fall down in such wind. The Taboo is very clingy, holds the air till the very minimum! And yet it still can do turns without hanging or playing dummy near the ice. It is hard to believe that there is almost 5 kg of "stuff" flying in the air. Such winds is the prey territory of specially designed "light wind" parafoils. I was right: there is a few inflatables out by the Boomerang besides fresh-built ski-jump. Nobody is excited enough to try lifting them in the air. I feel that the wind is dropping to 3 kt and this is the limit, so I do not stop passing by. 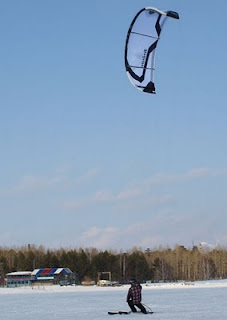 I see Vladimir Kovalenko on Paraavis VX-Light and Farid Saiffulin on some Elf kite coming out. Well, there is no miracles and by the shore with 3-4 kt wind the VX-Light flies away from me very fast. But as soon as the wind gets stronger in the sea up to 6-8 kt the difference with Taboo diminishes. I am practically on par with VX going upwind. But still even if Vladimir is faster then just by a little bit! I am surprised even more. I feel that in the summer this kite will be stellar. I ski another couple hours around the islands enjoying the process. Any cons? Yes, there is problems restarting. It is virtually impossible to lift Taboo-17 fallen at 4-6 kt over the ice. It requires to be turned over for "Russian start". But then it can start up with virtually no wind at all. At 6-8 kt there is no problems starting normally. A very interesting thought is bugging me. Of course, in winter low winds Taboo cannot really compete with huge open class 17-20 sq.m. sausage-like parafoils with aspect ratio of 7-8. However with the tendency of the racers community to have "National Class" kite limited in size by the next year this unusual inflatable machine designed specifically for races can make a real difference! I even have a huge suspition that Taboo-15 would adequately compete with race parafoils of the same size. Taboo-17 would beat 14-15 sq.m. parafoils for sure. If you take in account fair price this kite becomes even more interesting as te universal race machine for winter and summer. The inconvenience of restart in the marginal winds can be solved by the old method which worked even for the C-kites - the 5th line to the trailing edge. Today we had 10-14 kt by the shore and up to 16 kt in the sea. A note about pumping up of such "huge" kite. I fill up leading edge of my Waroo-13 to the working pressure in 80-90 strokes (it has separate struts). The front bladder of Taboo-17 (with filled and closed struts) takes 100-110 strokes to pressurize. Not a "huge" difference at all. In 10-12 kt self-start and restart in normal position is no problem! In 16 kt - no signs of over powering, everything is smooth and comfortable. Pulled trimmer a little bit - just to make the bar closer. No flatter on the leading edge, the wing flies normally. The race was around the square of 300-400m. The main courses are mostly half-wind. Need to make several rounds in the given time. I was the third or fourth. It was very important in such dense crowd to avoid dumps and make turns fast. I was skiing with great reserve avoiding trouble and did not rush. The kite gratified with its behavior on the turns. Its maneuverability was beyond the excellence! Lots of people fell and tangled on the turns. Later me with Ivan on Flysurfer Speed-19 and Stepan on Paraavis VX-17 made a little marathon race, around 15 km: Boomerang - Taiwan Isl. - Khrenovyj Isl. - Boomerang. All of my yesterday's conclusions stand true: VX is faster but not bu much. In 6 km of sharp upwind tacking only there was only 300-400m gain. Speed-19 was on par. 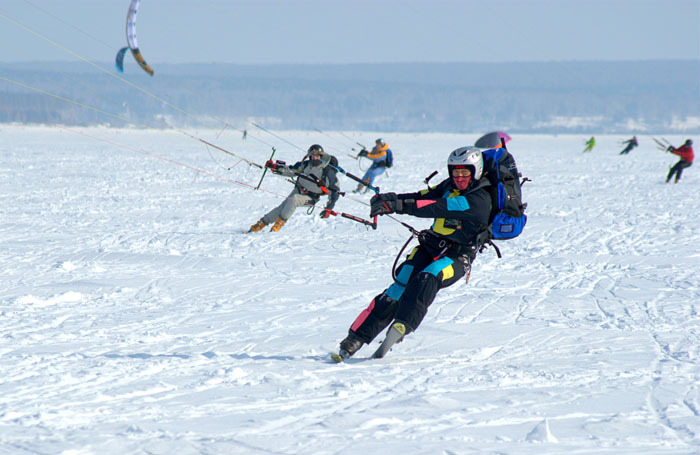 Everything is approximate of course, it all depends on the skis, friction and spacers between skis and kite as well... But the overall Taboo-17 is very competitive. Wind of 14-16 kt for this kite is perfect, everything is under control, no sign of overpower. According to GPS in two hours I made 75 km with 52 km/h max. Stepan on VX-17 showed max 56 km/h. He had an advantage but it was negligible. Today we had 20-22 kt and Slava said they have seen 24 kt at the Hydro Station. 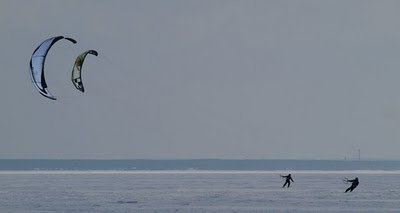 The only brave who dared to try the kite was Artur. Thanks to him I managed to take some pictures. How does Taboo-17 feel in such wind? Well, there is still no overpower per se. If the kite is up in neutral, trimmer - down, bar - up, you can stand picking your nose with no worries. No pulls, no lift-offs. Everything is under control. Going up-wind is not very pleasant. Most of the wing flatters, vibration is forwarded on the bar and you go on with clear idea that a smaller kite would fly faster. Going half- and down-wind is superb! You can release trimmer all the way, the speed is great. I did not have my GPS with me today but it felt way faster than yesterday's 70 km/h on a seven-meter kite. The top limit for this kite claimed as 20 kt has a lot of reserve. You can survive in bigger winds if needed. But if you like pleasant riding, you should not use it above 20 kt. Everything above is written considering Taboo-17 in application to races. But it won't be true to say that this kite is of interest for sportmen only! This is a great free-ride kite for anyone who is not going to compete and yet refuses to sit ashore in our slow winds in winter or summer. The Best kites utilize the best materials for the cold temperatures. This can be confirmed by two recent "not so warm" winters (Dib: this is all about Siberian winters!) when we used kites of this brand. At least, down to -15°C - no problems whatsoever. On the first day I was inflating-deflating the kite at -10°C and all valves worked like in the summer.